Can Dogs Eat Apples? 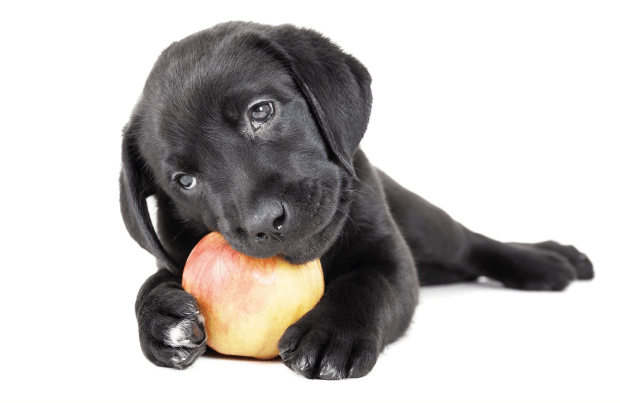 Is It Safe for Dogs to Eat Apples? Most experts agree that the flesh of the apple is safe for dogs to eat. And many recommend giving dogs slices of apple for a healthy snack. Help to clean residue off a dog’s teeth, which helps to freshen her breath. Apples are a good source of fiber as well as vitamin A and C. Make sure to take out the seeds and the core before feeding to your dog, as these can be choking hazards. For your younger, active dog, Dr. Chavez suggests feeding her apples for the benefits of their antioxidants and vitamin C, which some vets believe help with degenerative conditions like joint disease, and for the fiber, which can contribute to overall gastrointestinal health. As is the case with any food for your dog, fruits should always be given in moderation. Do not feed the seeds to your dog as they contain cyanide, a toxic substance. If your dog has diabetes or cancer, keep in mind that apples contain sugar; speak with your veterinarian about the effect apples may have on your dog’s system and health.